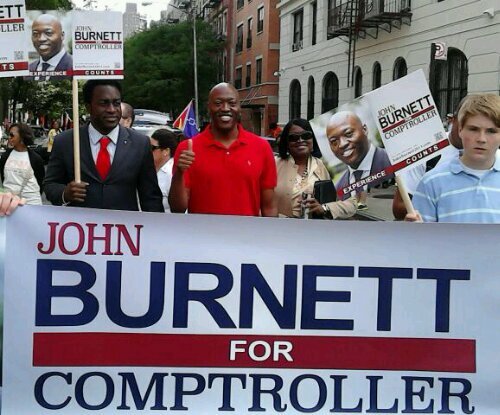 Republicans in New York City have a golden opportunity to win over minority voters with the candidacy of John Burnett for city comptroller. John Burnett is a genuine “only in New York story” that remains unknown to city voters six weeks from Election Day. Part of the reason’s obvious: The last Republican to win the comptroller’s job was elected in 1937 and again in 1941, and the local GOP is understandable focused the mayoral race..
You see, John was born in Brooklyn’s gritty East New York nabe. Until he was 6, his family lived in the Louis Pink Houses. Today, he owns a home in a newly upscale Harlem. This project kid and preacher’s son wasn’t “rescued” from his neighborhood schools by academic programs such as Prep-for-Prep or A Better Chance and whisked off to a prep school. Burnett graduated from local city schools and ultimately from Andrew Jackson HS in Queens. Not unlike previous generations of New Yorkers, John learned solid values from his late father, who rose from dishwasher to cook at Baptist Medical Center in East New York by taking every opportunity to learn a new skill. The dad would later become pastor of a storefront church in East New York, and eventually move the family to middle-class Queens Village. Months later, John went back to the financial firm in pursuit of a job. Armed with advice and a contact from a member of his father’s church, he got him a series of interviews where he talked his way into an entry-level analyst job. Burnett says that he and Joe Lhota share the same work ethic and approach to bringing efficiency to city government. His 20-year career in money management makes him well-qualified to hold the office of comptroller. And, as a highly qualified candidate, he gives the GOP a chance to make good on its promised outreach to minority voters. He calls it an opportunity for a paradigm shift. State GOP Chairman Ed Cox & Co. should want minority voters— especially those black and Hispanic Democrats who voted for Eliot Spitzer in the Democratic primary— to cross over to Burnett. They voted for Spitzer because they believed he would fight for them and protect their pensions better than Scott Stringer, who wind up winning narrowly. Burnett would do a better job than either Democrat. His experience and know-how meet the merit and character tests. The present “tale of two cities” narrative doesn’t have to end with the haves and have-nots battling each other. John Burnett stands astride both camps at the crossroads of preparation, opportunity, grit, character and merit. Maybe in the closing weeks of the campaign, more New Yorkers will consider beating the swords of class warfare into plowshares so we may sow the seeds of opportunity and merit. Then reap the rewards of economic success. After a summer of Carlos Danger, Client 9 and now “Che de Blasio,” New York voters could use a dose of the real thing. This entry was posted in African Americans, Elections, Government, Politics, Public Policy, The Economy and tagged Carlos Danger, Che, city comptroller, Client 9, Dean Witter, John Burnett, Scott Stringer. Bookmark the permalink. Best that he does not mention he is a Joel Klein fan (because Joel was totally inadequate regardless of zip code) nor that he voted for the morally challenged Spitzer. Best he stand on his resume and demonstrate his skills concretely. Then he might get a miracle in this poliical climate where being republican is akin to being an idiot sequestered to oblivion.